Hyderabad: Former South African cricketer, and the World Cup winning coach of the Indian cricket team, Mr. Gary Kirsten visited Sancta Maria School on Saturday along with his Gary Kristen Cricket Academy team. “Players perform their best when they are free to express their talent without the fear of its result” Says the World Cup Wining Coach of the Indian Cricket Team – Gary Kirsten as he addresses the parents at Sancta Maria International School, Hyderabad. 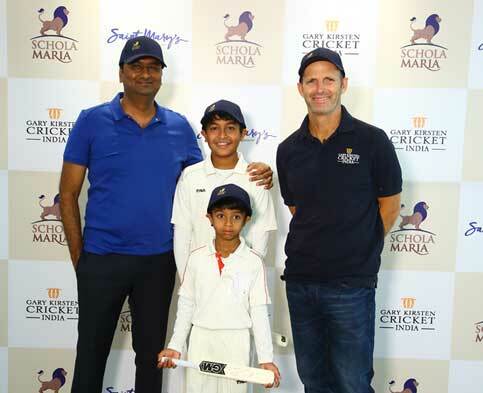 The Saint Mary’s Educational Society extended a warm welcome to International cricket legend – Gary Kirsten & his team from Gary Kirsten Cricket India, as they visited Sancta Maria to address the prospective parents for the group’s newest and most ambitious venture – Schola Maria. The multi-sport academy with an integrated international school, spread across 35 acres of land, brings together an unbeatable combination of world-class academics & unmatched sports training. Gary Kirsten Cricket India is the school’s esteemed partner to provide professional cricket coaching to aspiring cricketers. Gary, who is known for his unique batting style says “what I like about this education system is that it gives equal focus to education and sports.” He believes “Your journey is not just about winning as a sportsman, but that you get holistically developed.” Adding to which he highlighted the immense pressure that we as parents tend to put onto our children and need to stop. The joy of our young players of the Sancta Maria cricket team knew no bounds as they bowled for the batting legend while spending some time with him in the nets. Gary left them with a priceless piece of advice on how they can “show respect” to the bowler in the field and also take care of their bat. For young players, the key lies in “developing the child and giving him a positive experience while he is at school and seeing that he has an incredible journey through sport.” To do just this, Schola Maria, will serve as a home to every child of dreams of sports. Centrally located between the buzzing metro cities – Bangalore, Hyderabad & Chennai; with Cambridge curriculum and world-renowned sports institutions as partners, Schola Maria will be offering professional Cricket, Football, Badminton, Tennis and Swimming coaching to choose from, in its first year starting August 2019.